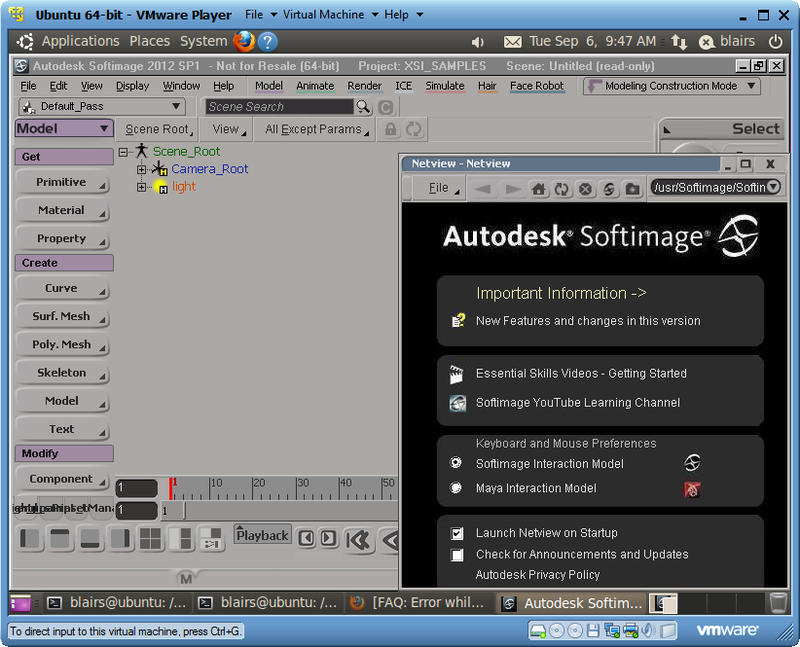 After a few false starts, I managed to get Ubuntu 10.04 running in VMware Player, and to get Softimage to start up. To get Softimage to start, first I had to edit MentalRayOptions.spdl and removed the µ (mu) character. Softimage still crashed at startup, so next I tried a tip I got from La Maison: setenv LC_ALL POSIX, but I still crashed. Finally, I edited $XSI_HOME/Application/layouts/Default.xsily and hid the OpenGL viewports, and then Softimage started up. I checked with QA, and they hadn’t had any luck either with nvidia drivers for Ubuntu in VMs. On Windows, I use Process Monitor, Process Explorer, and Dependency Walker. On Linux, the primary troubleshooting tool is strace. strace is a tool that traces all the system calls that a running process makes. When a program is experiencing problems associated with I/O, strace can often help in quickly isolating the problem, since (almost) all I/O happens through system calls. As well as system calls, strace also tracks signals that were thrown in the process. If a process is crashing due to a segmentation fault, it is worth investigating what was happening before the fault occurred; you can find where the fault occurred by searching for — SIGSEGV in the strace output. strace output has been added as an XSI history log client under Linux. If you search the output of strace for the string write(-1, you should see all the scripting commands as they are executed. This is useful for associating system calls with the commands that caused them to execute. In this case, Softimage 2012 on Linux would not not run with a MYECSP license. But it would run with a regular SFTIM (Softimage) license. /var/tmp/SoftimageLicense.log showed there was a “Server does not support this feature” error when Softimage 2012 tried to check out the MYECSP license. On the license server (a Windows machine btw), the LMTOOLS debug log file didn’t show anything (sometimes there are “denied” log entries that can provide a clue). FLEXnet Licensing checkout error: Clock difference too large between client and license server system. It turned out that the system time on the workstation was off by two days (it was two days in the past). Softimage wouldn’t use the MYESCP license because that license was from the future (it was a brand new license that had just been generated). The SFTIM license had been generated weeks ago, so that license worked ok. If Softimage can’t check out a license from the server specified in .xsi_2012, then it tries the servers listed in ~/.flexlmrc. So all I had to do was remove the extra license servers and leave only the server specified in my .xsi_2012 resource file. ~/.flexlmrc is the Linux version of the HKEY_CURRENT_USER\Software\FLEXlm License Manager\ADSKFLEX_LICENSE_FILE registry key on Windows. On Linux, Array.push will give you this error: “// ERROR : Object doesn’t support this property or method.” That’s because Softimage ships with an older version of JScript (5.1) on Linux. A customer reported that while he was running Softimage 2011 fine on Ubuntu, Softimage 2012 crashed at startup. For some reason, this causes problems on some Linux flavors, but not on Fedora. The solution was to edit the .spdl, and remove the “(µs)” from the string “Max Pixel Time (µs)”. Hat Tip to Sean Donnelly for the solution. Q: What version of Linux does Autodesk use in the Softimage graphics certification process? A: Autodesk Softimage 2012 graphics certification testing was performed using Fedora Core 14. The glibc version is missing from the FAQ page, but it’s a safe bet that it’s the same version used for the Maya certification.